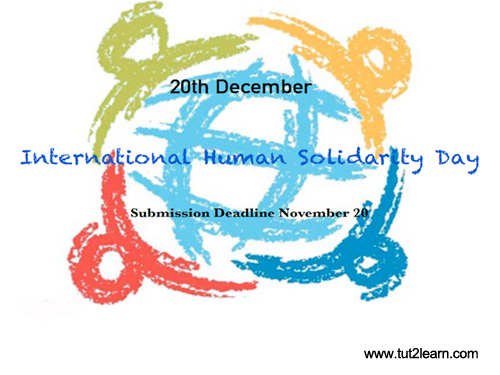 The United Nations’ (UN) International Human Solidarity Day is annually celebrated on December 20 to celebrate unity in diversity. It also aims to remind people on the importance of solidarity in working towards eradicating poverty. The UN emblem may be found in material promoting International Human Solidarity Day. The emblem consists of a projection of the globe centered on the North Pole. It depicts all continents except Antarctica and four concentric circles representing degrees of latitude. The projection is surrounded by images of olive branches, representing peace. The emblem is often blue, although it is printed in white on a blue background on the UN flag.